Hotter Shoes are known for their high quality, comfortable shoes, made in a wide range of styles, many of which compliment a vintage inspired wardrobe with ease. They produce most of their products in their factory in Lancashire, England, where they’ve been settled since they were established there in 1959. And for the first time, my tootsies are getting a look at what premium, comfort-driven shoes really feel like! House of Satin is a small British independent label with a long and storied history of making lingerie in the UK. In recent years they’ve become most known in our online vintage-style circles for their budget-friendly bras and girdles made from their vintage patterns. This year, however, House of Satin relaunched their brand with new lines, new fabrics and new price points, the latter of which seemed to displease some of the ladies who had come to rely on them as a cheap way to kit themselves out with their vintage under kit. Like the brand itself, the revamp comes with a story, one that stretches back into the roots of the mid-century that we love. So today, in the spirit of the new year, new iterations, new resolutions, I thought it was an apt time to share with you the history and passion of this British made brand. In 1948, following World War II, this story begins not with lingerie, but with wedding gowns, when a determined young woman started up her own bridal wear business and shop in the heart of Derby. When the tailoring and altering were done, the left over fabrics from the luxurious gowns seemed too valuable and beautiful to waste, so she decided to use the off-cuts to make bras and garter belts. The undergarments were so popular that they formed the basis of the lingerie company that still exists today. Vivien of Holloway is considered by many to be the ruling monarch of the British reproduction vintage scene. All their pieces are designed and made in the UK, most of their clothing styles returning season after season in new colours and prints, with an army of avid fans happy to expand their Grace, Kitty or Sarong collections. One of their most popular dress styles is the Halterneck Circle Dress, often referred to by lover’s of the style in shorthand as the HNCD. They watch the website keenly for the release of new prints, stalk eBay for signs of colourways they missed out on, and chat in Facebook groups about where they last wore their favourite dress. 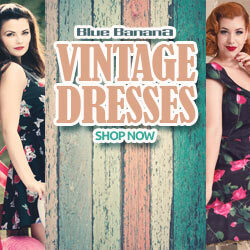 In terms of vintage style clothing, it’s a classic, one of those dresses that is quintessentially fifties. Almost every British pinup has one hanging in her closet, and I don’t know why it took me so long to try one.